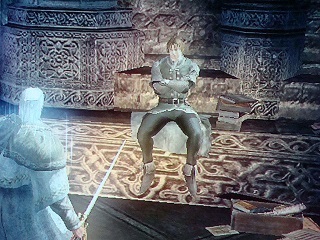 Freke's Apprentice is a NPC in Demon's Souls. Teaches basic spells if Magic stat is 10 or above. He will ask you to rescue Sage Freke from imprisonment in Tower of Latria. If you kill Sage Freke, the Visionary in the Nexus, he will become hostile and attack you. Casts Soul Ray when hostile, when his MP is depleted he will attack using his bare fists. What do you want, brute? I have no use for miscreants like yourself. Away with you! Are you here to face the Demons? If so, please free Sage Freke the Visionary from the dungeon of Latria. I will help you however I can. I can teach you elementary spells. Sage Freke is a gleaming hope for humankind, but I have not the power to save him alone. Freke is a great sage who systemised the magic of the Soul arts to make it possible for human imitation. By observing the state of Boletaria and the Demons within it, he is likely to pave the way for greater things. Are you begging for a magic lesson? Me? Without doubt, I made my best effort to save Sage Freke. But I had not the strength. It is as simple as that. Besides if I myself were captured, who would stand here and recruit rescuers? You saved Sage Freke, did you not? Then I was right to bend the rules and teach you a few tricks. Nevertheless, I am grateful to you. Do you see how important selfless acts are in this dreary world? What is it? Are you still begging for magic lessons? Oh, so be it. Better than having you bother Sage Freke. Sage Freke prefers to work alone. Do not dare to bother him by gabbing about trifling nonsense. He is on the verge of discovering something that will rival even the Demon Souls. Normally, it would not be granted to one such as yourself. I had to make an exception, for the sake of Sage Freke. Just ensure that you rescue Sage Freke as quickly as possible. Why have you madness about you? Cease!